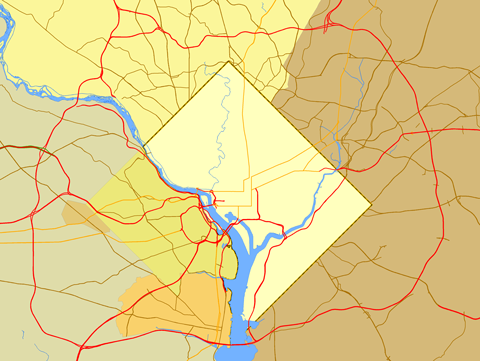 Sitemap to all pages covering the District of Columbia. Photography contributions by Alex Nitzman, Andy Field, Brent Ivy and Carter Buchanan. Washington Redskins (NFL) – moved to Landover, Maryland in 1997. Washington Caps (ABA), the Oakland Oaks relocated to Washington and became the Caps in 1969. Playing just one season the franchise moved south to become the Virginia Squires due to territorial rights with the Baltimore Bullets. Washington Nationals / Senators (MLB), the American League Washington Nationals, renamed officially to the Senators in 1955, left in 1960 to become the Minnesota Twins. A National League expansion franchise, also named the Senators, played in D.C. between 1961 and 1972 before moving to Dallas-Fort Worth to become the Texas Rangers.